Ford has unveiled the Mondeo ST-Line at the 2016 Goodwood Festival of Speed. 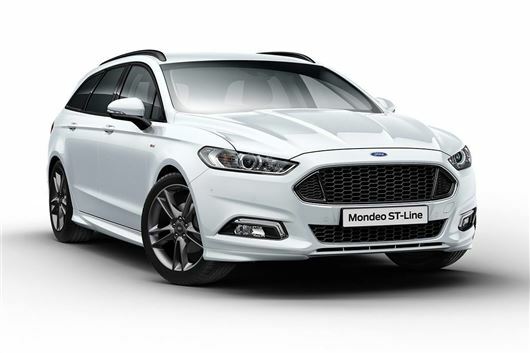 With sports suspension and styling inspired by the Focus ST and Fiesta ST, the Mondeo ST-Line will be available in five-door and estate body styles and will be on sale soon. Prices are to be confirmed, but expect to pay from around £25,000. Styling details include a honeycomb grille, a front bumper lip spoiler, a sports rear bumper with a diffuser, 18-inch machined alloy wheels or 19-inch grey alloy wheels, sports seats and a roof spoiler. Ford hasn’t announced the full engine list, but 150PS and 180PS diesels are confirmed. The 150PS 2.0-litre TDCi emits from 112g/km of CO2 and has an official economy figure of up to 65.7mpg, while the 180PS engine emits from 117g/km and has economy of up to 62.8mpg. Manual or Powershift automatic transmissions are offered and all-wheel drive is available. The Mondeo ST-Line joins the recently announced Fiesta and Focus ST-Line models, which follow the same formula of sporty styling with more economy and insurance friendly engines than full-fat ST or RS models. Read more about the other ST-Line models here.